So far, this Christmas season has been filled with fun and exciting room transformations. I have really enjoyed decorating our house for the holidays! This is the first year I have added Christmas touches to so many rooms, if you missed the kitchen tour, you can check it out HERE. The fun part of decorating this season was choosing a different theme for each room. I had several different ideas for Christmas decor, and for the most part it worked out pretty well…sort of. I admit to moving fully decorated trees around the house because my initial vision wasn’t exactly on target. Lesson learned, that’s ok. Next year will be better. I based our sunroom holiday decor on a silver and white color scheme. I already owned the flocked tree, white stockings, and tree shirt, but I hadn’t used them together in the past. Our sunroom has gone through changes as well. In the last year, we painted the mantel white HERE and added a beautiful birdcage chandelier SIMILAR HERE. I am loving the fresh clean look of the white mantel BUT hate the dark brown and gold toned walls! YUCK! The color has to go! I already have a fully decorated tree in the room but that’s alright…painting is the priority! The walls are too high for my husband to reach with our ladder so we will contract this job out. Out with the dark, and in with the light! OMG! The room is so bright now, and with the sun shining in, it warms not only the room but my heart 🙂 WE LOVE IT! Can you believe that crystal shines brighter against a lighter surface than a darker one? I kid you not! The birdcage chandelier is stunning in the space and our frameless mirror!? WOW! Loving the reflection of the chandelier on the mirror. Check out this mirror for a similar look HERE with the birdcage chandelier. The tree is even brighter and appears whiter as well…no joke! I frosted a couple mini trees I bought at Home Depot with snow spray HERE. Have you ever used this stuff, it’s pretty fun and easy to use. Still crushing on my French Country Balsam Hill ornaments HERE. As I mentioned in the kitchen tour, I spent a lot of time shopping our garage this season. I found items that I could reuse with just a little work. The stocking holders on the mantel used to be a dark brown, but with a little silver spray paint HERE..voila it matches my color scheme. Vase filler of birch wood, pinecones and white berries add to the theme. 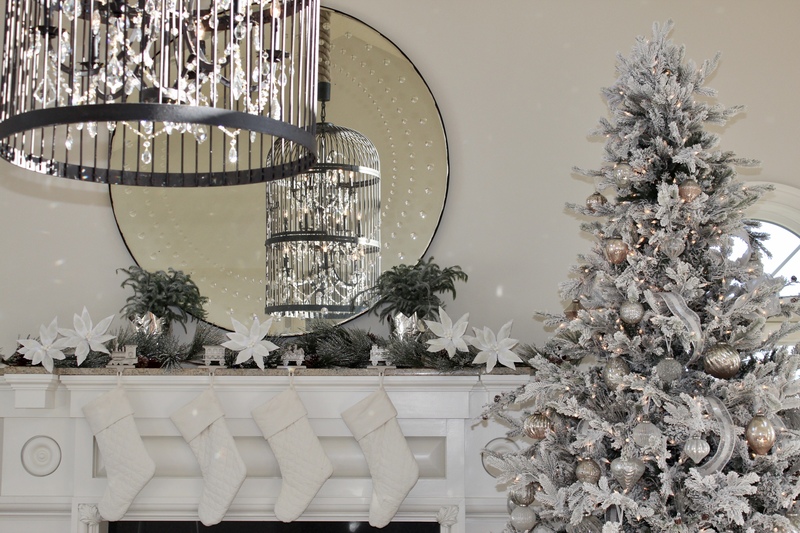 These 2 silver trees are part of the Martha Stewart Living collection at the Home Depot. It really is amazing at how bright the room is now. If the paint color looks familiar, that’s because it is the same color we used to paint our kitchen…color ASH by Restoration Hardware and paint by Benjamin Moore. If you’re ever looking for me, most likely you’ll find me here…on the sofa, blogging, and the fireplace lit. My favorite room of the house. That’s it for me, I have other rooms to finish up..stay tuned for more holiday inspiration! If you enjoyed this article, please tweet, pin, and repost. Follow along on Instagram HERE and enter for a chance to win an Amazon gift card and tea basket, click on the contest post and follow the directions…contest ends Dec 15, 2017. Good Luck! Wow!! this room is so beautiful! Great color … !! Thank you Ingrid! The wall color turned out really well, we love it! I was expecting a home tour and only saw pictures of one room. It was pretty though. Thanks for stopping by Shelly. The name of the post implies a one room tour. Stay tuned for more rooms coming up in future posts. Soo gorgeous!! I love sunrooms and yours is spectacular! I love your white color scheme. So light and bright. Perfect. Thanks Lynn! You’re so sweet. We are happy with the light color, looks really nice. Better than the White House. Hi Donna thank you! You are too sweet. Have a wonderful Merry Christmas! absolutely beautiful. you have tastes and great ideas. Looking forward to your style of 2018. We will see them together, just cannot wait. Take care and enjoy your festive days. You’re so kind! Have a wonderful New Years!